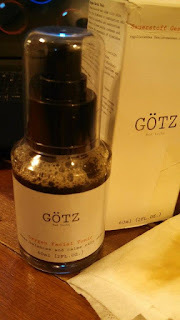 GÖTZ Bad Ischl Oxygen Facial Tonic is made with all natural ingredients to treat blemished skin, oily and combination skin and to reduce redness. I will warn you before I get into how great this product is...it stinks to high heaven and back. But...and that is a big BUT...it works really well! After you wash your face, spritz this onto a cotton pad or tissue, wipe on. It really soaks up and oil you may have and prevents more from forming for HOURS! There are many products out there on the market that are good for controlling oil, but this is by far one of the best remedies. THE BEST ACNE TREATMENT: Our Facial Tonic Treatment is a powerful and effective drying solution for men and women with troubled skin types that are looking to attain a clean, clear and beautiful appearance. This fantastic treatment can control acne removal like no other! FOR ADULTS & TEENS: Bad Ischl Tonic is suitable for adults & teenagers alike. Whether you suffer from dry, sensitive or oily skin, have no fear, our specially formulated tonic is suitable for all skin types. ORGANIC & 100% NATURAL: GÖTZ Treatment is Paraben-Free, Gluten-Free, Cruelty-Free, & Fragrance-Free. Improve Complexion & Skin Tone, Extract Dirt & Impurities, & Leave Your Skin Clean, Hydrated, Soft and Radiant. My skin was so soft after using this. I had a matte look to my skin which I am always trying to achieve. And the redness in my skin tone was toned down considerably. I really like the ingredients too!